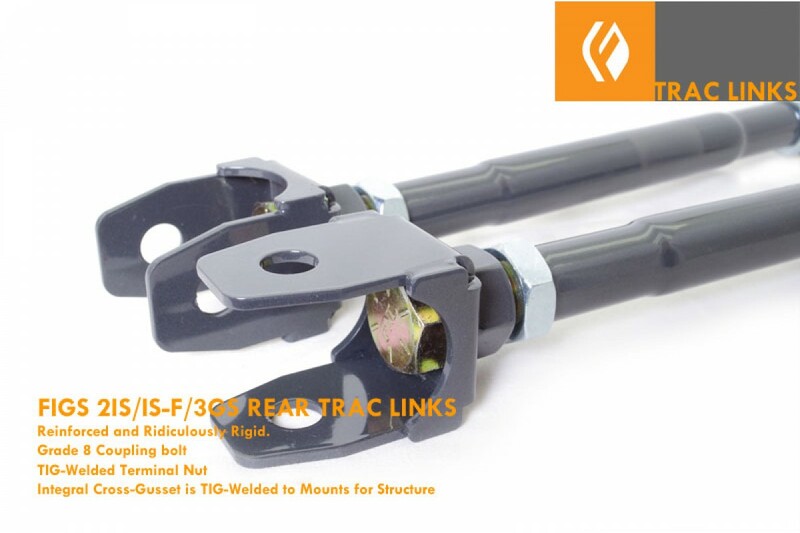 The stock TRAC (or traction) links on the ISX50 and Gen 3 GS are fairly stout but they do have several weaknesses, adjustability and staked rubber bushings. 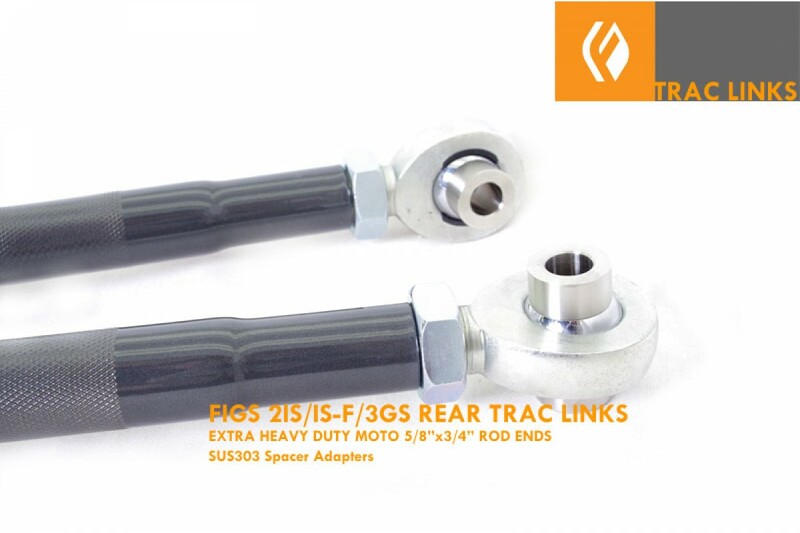 FIGS has taken a long time to develop an OEM quality solution that allows easy adjustment, long product service life and increased rigidity to handle the high horsepower IS-F on the circuit. We took a fresh approach using a heavy 3/4" grade 8 stud with a welded terminal nut on the opposing side. 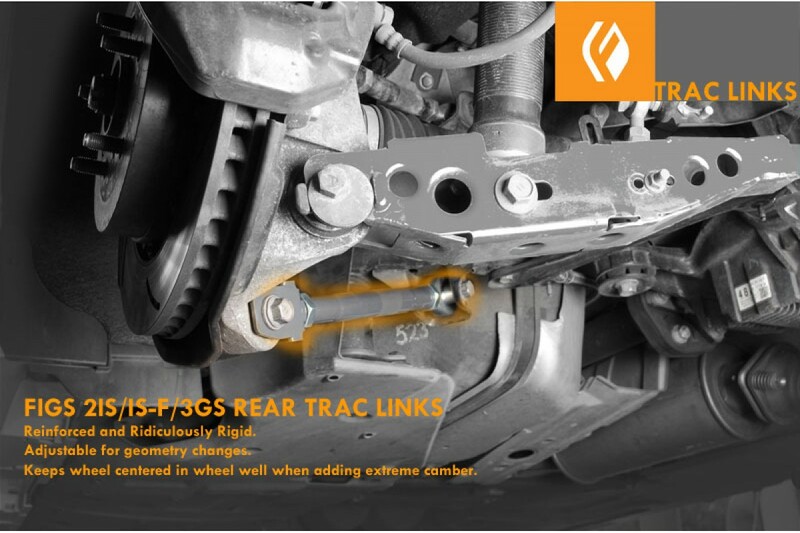 These two pieces sandwich and reinforce the flange on the link and ensure minimal deflection under acceleration and braking loads. On the chassis side we decided to use heavy duty MOTO rods ends that have a 3/4" shaft thickness and a 5/8" eye. The radial load rating is 31680 Lbs.! 1.25" swaged steel tubing finish the recipe for a firmly planted rear end that will give confidence during cornering as the last piece in the rear suspension puzzle comes together. Location: Front Lower of the rear suspension. Influence: Location support of rear knuckle under acceleration and braking, Centering of wheel in wheel well during alignment. The clevis is now 304L stainless steel for long-term corrosion resistance. 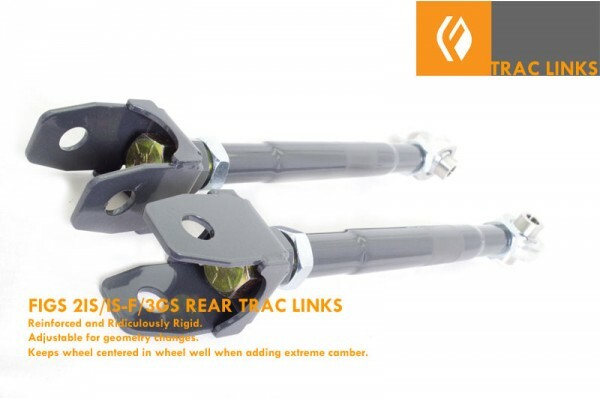 Length adjustment of up to 1.75" without removing from the vehicle. Increases rear traction and stability in corners and braking. Reinforced boxed clevis ends for zero deflection. Perfect for the track, street or strip. Top quality materials and workmanship mean you are buying the best product on the market compared to low quality competing parts. HEAVY DUTY Slot Injection Molded Race (2-P)MOTO and Precision (3-P) rod end choices, PTFE lined. Grade 8 3/4" Hardware-Coupled Clevis to TIG welded terminal nut. Swaged 1.25" SAE 1012 steel tubing for reduced weight and increased strength. Knurled for grip and 2-stage powdercoating over zinc for corrosion resistance. Includes tubing for alignment adjustment with locking pliers. Rubber Boots available as special order. NOTE that this means more maintenance. Rubber boots require that dry lube be applied inside the boot to prevent the rubber from interfering with the rod end race. Contact FIGS for more information or questions. Min length is Stock length, for special requests please contact us or add notes to your order.